This Friday, stomachs still full from Thanksgiving festivities, Dawn and I woke up at 4:30am and donned our green robes. We rushed over, fighting the cold and dark, to the Macy’s on 34th Street. It was Black Friday, and doors were set to open at 5am. As usual, a visceral crowd of people stood at the entrance waiting for the countdown and the doors to open. They’d probably been there for hours — eager to be the first ones to the shelves and discounts. When the doors did open, the shoppers rushed in. Along with them was Rev. 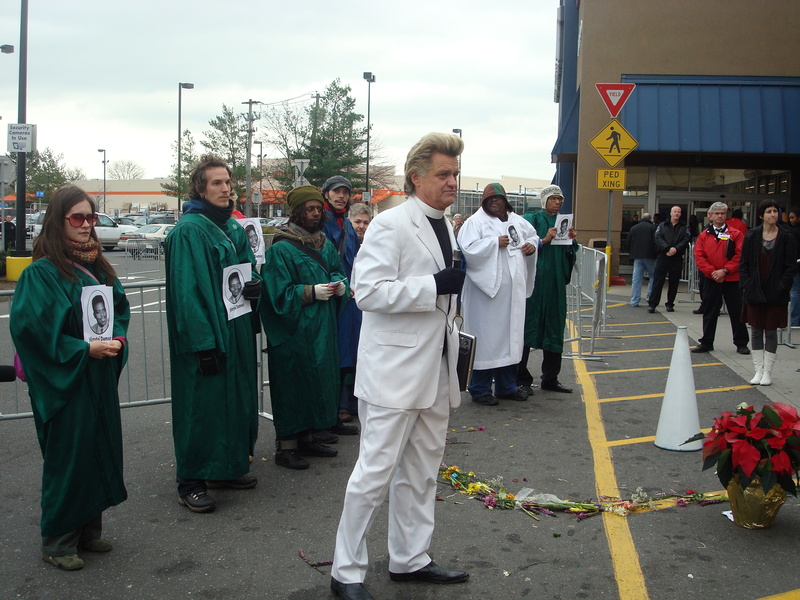 Billy and a small contingent of his choir, urging shoppers to turn around and go home. It was a short run, we entered briefly with the shoppers and shouted as loud as we could. Then we went back outside and greeted the stragglers, handing out flyers on Buy Nothing Day and consumerism. Very few heads turned. Most just went right on inside and did their holiday shopping. It’s tradition, after all. At 10am we were at Penn Station waiting for the train to Valley Stream — the site of the Wal-Mart where store employee Jdimytai Damour was trampled to death when shoppers stormed the store last year. We arrived in Valley Stream and I looked out from the station at the vast array of car-centered amenities. We were now clearly in a place that was built for the automobile. 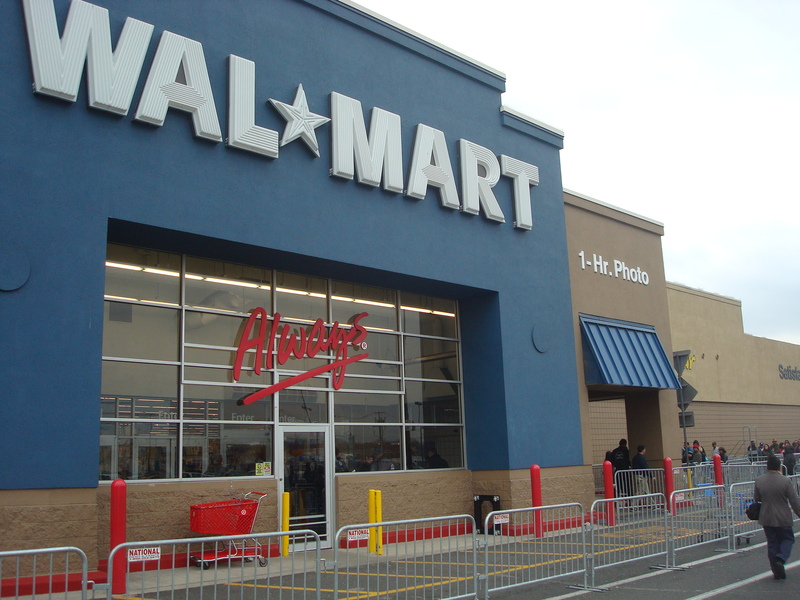 To get to the Wal-Mart, we walked along the narrow edges of highways and crossed the vast black emptiness of big-box parking lots for 20 minutes. The store was surrounded by a fortress of Big-Boxes: Best Buy, Target, Home Depot, Petsmart, and more. When we finally arrived, we noticed that the store had taken extra security precautions this year. There was a long line of people in barricades waiting to be let in. Two mounted policemen patrolled back and forth. We had flyers with Jdimytai’s face on them explaining his story and a bag full of flower petals we planned to scatter on the site of his death in memoriam. The plan was to start at the end of the line of would-be shoppers, singing “Back away from the Wal-Mart/back away from the sweat shops” and handing them flyers. Before we started, Rev. Billy reminded us that in many ways Jdimytai had become the center of the anti-consumerist struggle in New York. He was a victim of the social consequences of consumerism. “The indigenous holy days that rise from the solstice – Christmas, Kwanzaa, Hannakah and all the rest – offer us an unseen opportunity. This is the day that there is seconds more light and heat, as the earth and sun roll back toward what will become the unleashing of life called Spring. So the holidays in late December are the seed of change. Christmas is radical, and life is out of our control. All we can do is pray for the best, honor it, because it is the beginning of a miracle. It’s not a Consumer event. Shortly thereafter we left the cops and security guards alone and made the trek back to the station. Dawn and I decided to take a cab there along with several other choir members, weary of the 20 minute empty journey back. Until fairly recently, “Black Friday” was associated with crisis and scandal. In 1869, stocks plunged when a group of speculators, headed by James Fisk and Jay Gould, cornered the gold market and inflated prices by nearly 30 percent. When the government put it’s own gold on the market, the premium plummeted within minutes. Investors scrambled to sell their holdings. Many were ruined in a matter of minutes. In 1965, “Black Friday” took on new meaning when the Philadelphia Police Department used the phrase to describe the year’s busiest shopping day, the Friday after Thanksgiving Day. It is not a term of endearment for them. “Black Friday” officially opens the Christmas shopping season, and it usually brings massive traffic jams and over-crowded sidewalks as stores are mobbed from opening to closing. Last year alone, Americans spent $41 billion — $372.57 per shopper — on this one frenzied day. Good news for the economy, but bad news for citizens. We’re all familiar with the images of people waiting in line for hours in the cold and trampling each other, sometimes fatally, to be the first ones inside. At a Long Island Wal-Mart last year, employee Jdimytai Damour was stomped to death as the throng of product-hungry shoppers stormed the store. Buy Nothing Day, an international day of protest, was created to counter this mad dash for the shelves. Founded in 1992 by Vancouver artist Ted Dave and subsequently promoted by Adbusters magazine, Buy Nothing Day urges participants to “lock up your debit card, your credit cards, your money clip and see what it feels like to opt out of consumer culture completely, even if only for 24 hours.” The event has become a yearly rallying cry for hundreds of thousands of activists around world who still believe that Black Friday is marred in crisis. On this week’s show, I’ll be speaking with Rev. Billy, an outspoken performance-activist who resists consumerism with the Church of Life After Shopping. The Morgan Spurlock produced film What Would Jesus Buy? documents the Church’s cross-country tour denouncing the commercialization of Christmas, materialism, and over-consumption in American culture. We”ll talk about consumerism, how it rules our lives and economy, and it’s consequences for ourselves and our Planet. Tune in Tuesday, Nov. 24 at 8pm for an hour of funk, jazz-fusion & their more experimental offshoots, then at 9pm for the show.